Rheem is one of the top names in both air and water appliances today, and for good reason. The company places an emphasis on customer care and quality, and have produced many innovative designs during its first century in business. Read on to find out more about this leading-edge company and the many quality product lines their Water Heater Division has to offer. In 1925, brothers Donald and Richard Rheem (with some financial help from their brother William) created a co-partnership with the Pacific Galvanizing Company to galvanize steel drums in Emeryville California. Soon after, their plant was enlarged and they created a second co-partnership under the name Rheem Manufacturing Company, this time producing the steel drums. By 1930, the brothers had been so successful that they incorporated the company, absorbing both co-partnerships and purchasing the Republic Steel Package Company. The merger added a new plant in Richmond, California, and added new products to their repertoire, including boilers and tanks. A year later, the company bought out the John Wood Manufacturing company and began making automatic gas storage water heaters. Fast-forward to the late 1940s. Rheem had contributed heavily to the war effort and were now switching back to consumer goods. With plants across the US and overseas branches in both Australia and Brazil, the company would continue to grow rapidly, ending out 1960 with 42 plants in 19 countries. The company split into two divisions in 1973, with the Air Conditioning Division focusing on HVAC applications, and the Water Heater Division focusing on water heaters. These two divisions continued to improve the quality of their lines, producing some of the most innovative and space-saving appliances on the market. Today, the Rheem Water Heater Division has several lines for both residential and commercial use that sit at the cutting edge of technology and efficiency. They also manufacture water heaters for the Richmond brand. 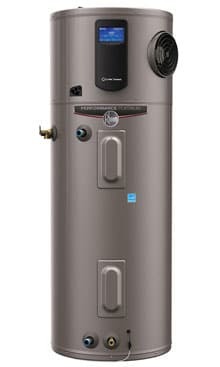 Rheem currently has several lines of gas water heater available in five series, each of which have their own standout features. These lines run from the most basic Performance line to the environmentally friendly Performance Platinum and Professional Prestige lines. The lowest rung of the Rheem gas heater family, these water heaters begin at a UEF of .54 and top out at .81 for the most efficient model. Tank sizes range from 29 to 98 gallons, allowing for that perfect fit. Performance lines are quieter and lower-maintenance than most comparable lines, making them a great choice for single-family homes. Rated at Low NOx or Ultra Low NOx, the Performance Platinum lines begin at .58 UEF and are eco-friendly. Several lines are ENERGY-STAR rated, making the lines of this series perfect for eco-conscious homeowners. The Performance Plus lines rest in the middle of the standard and Platinum series. These models range from .58 to .65 UEF. The atmospheric line is Low NOx, while the Ultra Low NOx models take air quality a step further. All models include diagnostics controls and are eco-friendly. Designed primarily for use in new homes, the Professional Classic lines are designed for better overall efficiency. Ranging from .51 to .71 UEF, these models are all Low NOx or better and feature EcoNet capabilities. Leak detection and a recirculation pump help keep bills lower for better peace of mind. The creme of the crop in Rheem’s gas water heaters, these models range from .64 to .83 UEF and have all the features of the Professional Classic series. All models are ENERGY-STAR rated and many are eligible for tax credits. More efficient than gas, it’s no surprise that Rheem’s electric heaters have more series than their gas heaters. These are among the best on the market, and many are sized for smaller homes. All electric models have Low NOx or better emissions, leak detection, and are recirculation pump compatible. Beginning with a UEF of .92 to .93, the Marathon series includes standard tanks, point-of-use, and thermal storage tanks. All models are highly efficient, durable, and corrosion-resistant. The bowl-shaped underside improves drainage, and the entire body is non-metallic and lightweight for a long-lasting tank that sets new standards. Rated at .92 to .93 UEF, these 28 to 50 gallon heaters are some of the most efficient models on the market. Premium anode rods and dual copper heating elements add to the quality, providing a much longer life and lower maintenance needs than most of the competition. A smaller .81 UEF table top model is available for fitting into those smaller spaces. The top of the Performance series, the Performance Platinum boasts a UEF of .92 to .95 and range from 40 to 55 gallon tanks. Many of these models offer the PlusOne water management system and high-quality anode rods. Models are self-cleaning to help combat sediment buildup. Rated at .93 UEF, these 40 to 50 gallon water heaters provide high performance without a high running cost. Dual copper heating elements allow for quick response, while premium grade anode rods help increase the tank’s lifespan. Ranging from a modest 3 gallon point-of-use to 55 gallons, the Professional Classic line covers a wide range of home and mobile needs. All models have high-quality heating elements, with the non-point-of-use models featuring Lifeguard lower heating elements. Many models also include the EverKleen self cleaning device to help combat sediment buildup. Available in either 40 or 50 gallon models, the Professional Prestige series have all of the benefits of the Professional Classic, plus EcoNet WiFi capability. Dual 5500 watt stainless steel heating elements provide long-lasting performance, and all models feature the EverKleen system. Best of all, the entire line has a .93 UEF, making these some of the most efficient models on the market. Hybrid water heaters take the efficiency of an electric heater and crank it up a notch. Depending upon the model you choose, Rheem’s hybrid line may meet NEEA tier requirements. All are ENERGY STAR rated and have a UEF rating between 3.50 and 3.70. EcoNet compatibility means you’ll never have to worry about performance issues when not at home. Rheem was one of the pioneers in hybrid electric water heaters, and remain at the pinnacle of hybrid technology. When searching for an environmentally-friendly and cost-effective water heater, these should be your first stop. Rheem includes their major series in the tankless lineup. However, these are broken down based upon the level of efficiency. With ratings of up to .94 UEF, the tankless heaters of this class include models from the Performance, Performance Platinum, and Professional Prestige lines. These heaters have intelligent electronic controls for improved safety and efficiency, and several condensing models are available for even more savings. Many members of this category are ENERGY STAR rated, making it one of the most competitive series of tankless heaters on the market today. Boasting a still-impressive UEF range of .81 to .82, Rheem’s mid-efficiency tankless heaters feature both indoor and outdoor models. An all-copper heat exchanger provides minimal transfer loss, and the EcoNet capability means you can keep track of your heater’s performance while on the go. With representatives of the Professional Classic and Performance series, these models are anything but standard. The Performance series boasts an efficiency of 99.8 percent, making these unbeatable in terms of energy efficiency. Best of all, these water heaters all have digital displays (to make troubleshooting a tankless Rheem easy), compact designs, and are easy to install. One of the most environmentally-friendly technologies out there, solar-powered water heaters are perfect for sunnier climates. Most of Rheem’s solar heaters use electric or gas backups to provide hot water on cloudier days. In addition, these heaters introduce cold water at the bottom so that hot water stays hot. Depending upon the type of water heater you invest in, there may be a number of parts which need maintained or replaced over time. Gas heaters have the most replaceable parts, while tankless have the least. Among the parts you might expect to maintain or replace are heat exchangers, burners, valves, anode rods, temperature controls, and valves. Rheem water heaters can be purchased at Home Depot, Amazon, and other local and online retailers. Bought my hot water heater last week, lower element never worked had voltage. Had local plumbing company change lower element. Now thermostat not functioning and no power at lower element. Customer service is lousy!! Won’t refund us almost $800 on brand new unit. Needs two repairs already. Totally unacceptable!!! Sorry you had that experience. Unfortunately, every manufacturer is going to have a lemon every now and then. I can’t believe the seller wouldn’t refund you or replace with a new unit on a 1-week old water heater. 29 gal water heaters are not repairable. $20 part goes out and instructions- techs say must replace whole heater as its a sealed unit. Same mentality that led to demise of American auto industry- – planned breakdowns to force people to buy again. Never worked as a business model and never will. Forces conumer to buy foreign made products.